In a genre that's growing staler with every new release, "So I'm a Spider, So What?" is a a cut above. Here's why. Stories where characters get transported to another world, or isekai, have been around for quite a while at this point, but it’s really only been within the past 10 years or so that the genre has coalesced into the incredibly popular subset of fantasy we know today. Too popular, maybe, since now some publishers are actively avoiding it. For example, in 2017 Kadokawa banned isekai submissions from one of its light novel contests. So if you’re an isekai writer, how do you make your work stand out in an oversaturated field? Well, you could try making your characters appear in the other world as something other than human. A spider, as in So I’m a Spider, So What?, might not be the weirdest choice compared to the one where some dude gets turned into a vending machine, but it does work the best out of any such story I’ve read. So I’m a Spider, So What? is based on a light novel of the same name, written by Okina Baba with character designs by Tsukasa Kiryu. As far as I know, aside from the addition of Asahiro Kakashi as the manga’s main artist, nothing has changed in the transition from novel to comic. The story goes like this: a “bottom-of-the-barrel girl” and all of her classmates are painfully sucked out of their reality and brought somewhere else. When our nameless protagonist comes to, she’s alone and inside what she believes to be a sack. As she takes stock and claws her way out, she realizes that it was not a sack but an egg, and she’s one freshly born spider in a roiling mass of thousands of other baby spiders somewhere deep in a cave. Spider cannibalism is actually a fairly common thing, and the main character’s life is immediately threatened by her siblings, and then a much larger spider, trying to eat her. She escapes this immediate danger, only to run headlong into a host of other dangers, and spends the rest of the book learning about herself and her capabilities while struggling to survive. She happens to come across human boot prints and realizes that she’s not tiny as she’s assumed, but actually about the size of a dog. She learns that she has RPG-like abilities, stat charts and skill trees that seem to appear in the air in front of her and can be navigated like an old DOS-style text-based adventure game. 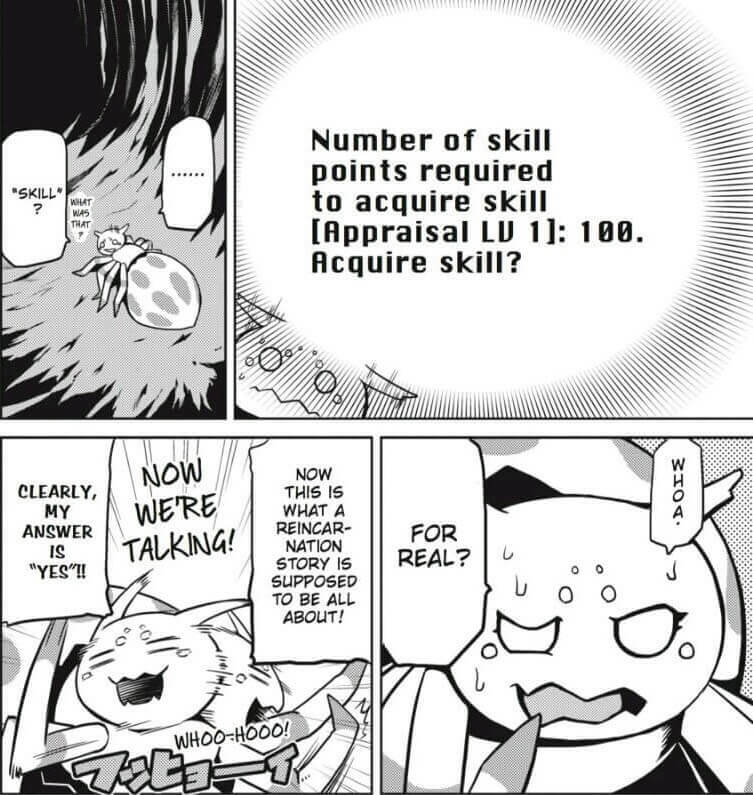 Her skills level up as she uses them, whether that’s through spinning webs or getting slathered in acidic spit by other cave creatures, and if she levels up enough she can evolve, which she manages to do by the end of this first volume. The thing that sticks out the most to me about this book is the characterization of the spider. As the only sentient being in the dungeon, she’s the only one with dialogue or development of any kind. She does a lot of talking to herself and recognizes her new world as game-like right off the bat. Combined with the way the first few pages present her classmates as featureless and nameless, you get the feeling that she’s a nerdy loner (she eventually states this out loud, which is too bad, since it makes the writing’s surprising subtlety up to that point kind of meaningless). Her internal monologue is snarky and combative but not overly mean-spirited, and despite her assertion that she’s “bottom-of-the-barrel”, she proves quite capable when the chips are down. She seems like a nice kid. Except now she’s a spider, and honestly, that’s the most charming part of the book. 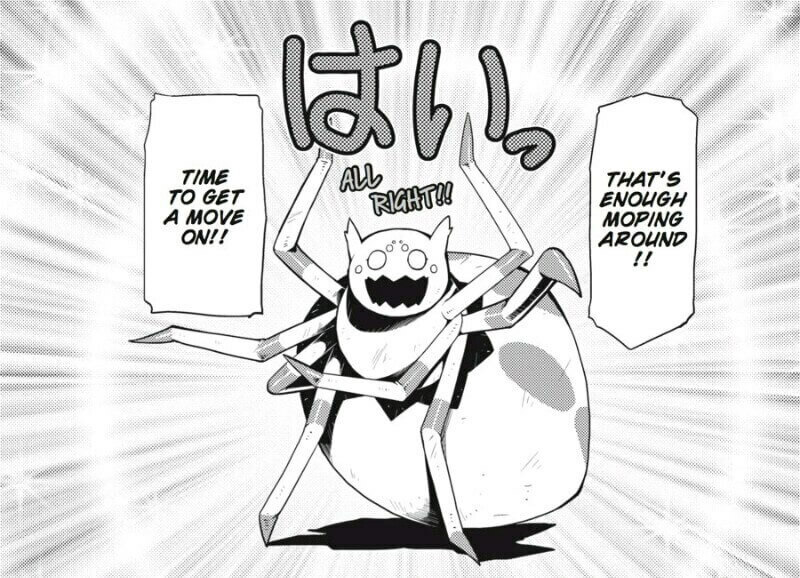 The art is light on backgrounds but heavy on adorable, expressive spider body language. Artist Kakashi makes particularly great use of the fact that spiders have eight legs, often drawing two different gestures at once or putting the protagonist in complicated and hilarious poses. As the book goes on and she learns more about what she can do, the protagonist starts to run away less and fight more, and somewhat to my surprise, the action scenes are great. The flow of the battles is perfectly clear, and she uses her web-slinging in inventive ways to take down monsters she has no business killing at her level. My only real complaint with this book is that by the end of the volume, we still know almost nothing in the grand scheme about the protagonist’s situation. Where is she exactly? “A cave” doesn’t quite cut it. I need more details. What happened to her classmates? Are they all monsters somewhere too? 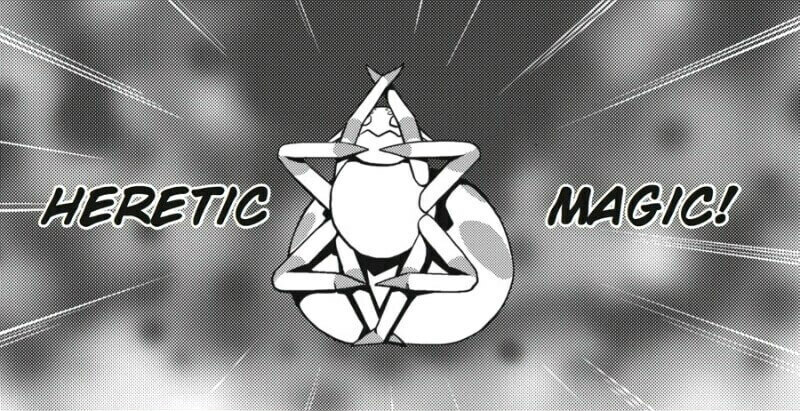 Why is she a spider? A lot of things happen, yet the plot barely goes anywhere. It’s still a fun read, but that’s entirely on the strength of the spider girl as a character. Leaving some questions unanswered can be a hook in and of itself, but if you leave too many questions unanswered, it ends up feeling like a failure to flesh out the world effectively. A lot of times, world-building is the draw for isekai stories. But despite my complaints in that regard, I’d still recommend So I’m a Spider, So What? to genre fans. It’s cute and funny, but there’s probably enough action to satisfy fans of the grimmer, more self-serious end of the genre. And really, anyone looking for a change of pace should check it out, if only for the novelty of a female, non-human main character. In a genre that’s growing staler with every new release, So I’m a Spider, So What? is a a cut above. You can order So I’m a Spider, So What? Volume 1 on Amazon. Thank you, Yen Press, for giving Yatta-Tachi and myself the opportunity to review the first volume. Excellent review, you really did a good job marking the good and bad point of the volume. About the lack of world bulding, thats because the manga is not adapting one of the multiple side stories (the ‘S’ chapters others are “K, Y, H, B, Blood, etc”) these chapters are from the view of another student who reincarnate as a prince, and for the story’s plot its going to take a long time before it shows in japanese the manga has 54 chapters and the plot from spiders side its just starting (from the novel view this is on the chapter 120 of 529 still ongoing).